Thinking about building a home? If so, congratulations; a home building experience is an exciting time! You may already have a few ideas in mind, with help from websites like Pinterest and Houzz; but knowing that they will work for your new home and how to get from here to your finished project is important. There are a number of steps in this process, from the Schematic Design to the Construction Drawings to the actual Construction of your home, which we can help you with. Let’s learn a little bit more about these steps. 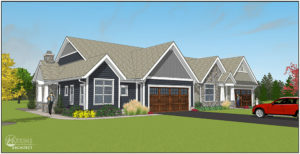 Once we have met with you to discuss your ideas and you have decided to select Watkins Architect for your home project, we can move forward to prepare sketches of what your home layout might be and what it might look like inside and outside, utilizing various drawing types to convey our ideas. One of the drawing types is sometimes called an artist’s rendering; a 3-dimensional drawing depicting the exterior look of your home. We will work together to guide your project design, incorporating your input, during this fun part of the process. This beginning step lays the foundation for bringing your dream to reality. Additionally, during this phase, we research the various building and zoning codes that need to be addressed as part of the project. Any special design requirement that you may desire to incorporate as part of your project, such as green technologies, will be initially addressed. Once we have arrived at the design that reflects your vision and needs, we can move forward to the preparation of Construction Drawings! We will work together with you to help you make decisions and further visualize the details of your new home; such as ceiling, floor, and wall finishes; doors and trimwork; lighting and plumbing fixtures; and the exterior wall materials and colors. It can also include decisions regarding the various systems, such as electric service, and heating and air conditioning. These drawings and specifications are then utilized to obtain the necessary permits, obtain pricing from contractors and communicate to the contractors both the look and specific requirements for your home. Upon completion of the process of obtaining prices from contractors, selecting the appropriate contractor, and obtaining the necessary building permits, you can now move forward to the exciting step of building your dream home! Watkins Architect can continue as your professional agent with services such as monitoring the construction activities with site visits, reviewing contractor pay requests and reviewing the construction to confirm that it complies with the project documents. Building a home can be both an exciting as well as a challenging time, but here at Watkins Architect we offer our vast experience and knowledge to guide you through the process, making the design of your home as enjoyable and satisfying as possible! Interested in seeing some successful home projects we have designed for customers? 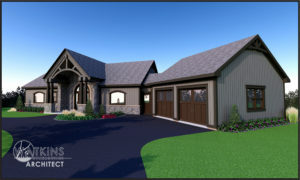 Check out our portfolio page and contact us today to schedule an appointment to discuss how to “Build Your Dream Home”. Watkins Architect is a local architectural firm that can handle the designing of your home. Watkins Architect handles all types of architecture projects from residential architecture to commercial and educational. We work throughout the Berks and Lehigh area and all across Pennsylvania. Browse through our portfolio to find out what architecture projects we have completed.